Finding the problem’s source is essential for a successful repair, saving time and frustration during the repair process. However, seeing through walls, under ground and inside pipes is difficult. That's where Mendel can help. Using industry-leading techniques and technology, the professionals at Mendel Plumbing & Heating will discover what is causing the problem, so we can offer the right solutions. Sometimes the best way to find a problem is to see inside the pipes. Our service professionals have advanced video equipment we can use to look inside the pipes and sewer system to spot the obstruction or other problem. This lowers the repair costs by saving time and guesswork throughout the process. Not all plumbing leaks are easy to spot. Our team will thoroughly inspect your home, using specialized listening devices and our knowledge of plumbing to locate the leak, even if it is hidden under the floor or behind a wall. Once we find the leak, your technician will diagnose and repair the problem. Whether you have damage to the pipes inside your home or the sewer pipes in your yard, our service technicians will find and repair the problem, returning full use of your system quickly, no matter what caused your leak or clog. When pipes are frozen, the water inside expands and places pressure on the pipe that can cause cracks. Thawing the pipe improperly can cause the pipe to burst. 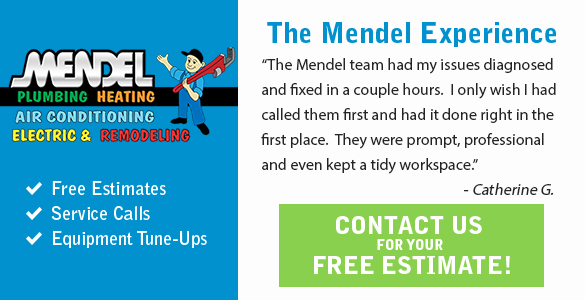 Call Mendel for expert help in thawing the pipe to prevent a serious leak or burst pipe. Once the water is flowing, we will help you put protection measures in place to prevent it from freezing again. Sewer and drain rodding can often fix a clogged drain and get the water flowing again. This process involves using a sewer rod to push the clog or obstruction through the line. For clogs that are viscous in nature, such as oil or mud clogs, power jetting the sewers can effectively and affordably remove the problem. Using our high-pressure equipment, we can send a powerful jet of water through the sewer system, pushing away the blockage and eliminating the clog. Whether you are struggling with a leak, need clogged pipes unclogged, want help with pipe thawing or simply want to have an older system inspected to confirm that it is fully functional, you can be certain you will receive quality service backed by industry-leading workmanship warranties when you call Mendel Plumbing & Heating. We offer pipe and sewer repair services to homeowners in St. Charles as well as the surrounding Fox Valley communities of South Elgin, North Aurora, Geneva and Batavia. If your sewer system or pipes are showing signs of problems, call Mendel today at (630) 475-4239, or use our online form to request a quote.